After speculation, delay, and even a blockbuster lawsuit, the $140 million Broad Museum finally announced last week that it will be opening its doors in Fall 2015, about a year behind schedule. 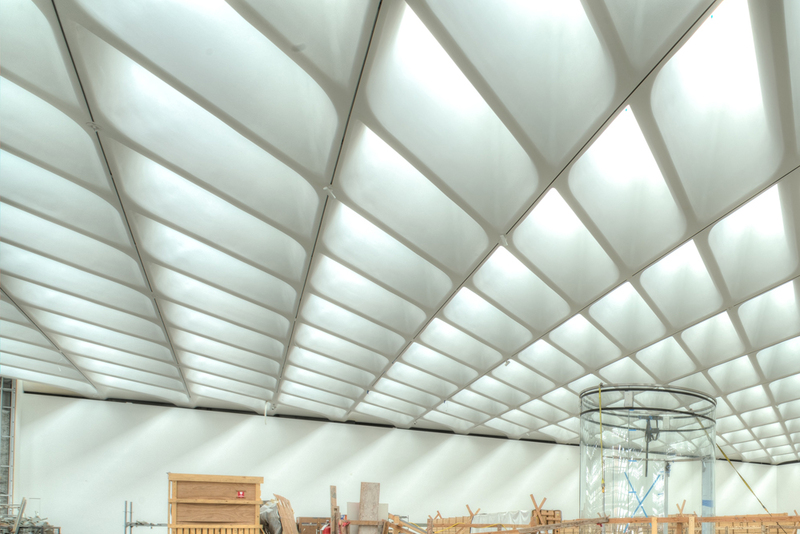 Designed by Diller Scofidio + Renfro, the Downtown Los Angeles museum will contain more than 2,000 works of contemporary art—part of the Broad Art Foundation’s growing collection—and admission will be free to the public. AN West Editor Sam Lubell talked with Broad Art Foundation Director Joanne Heyler to get the latest on the project. 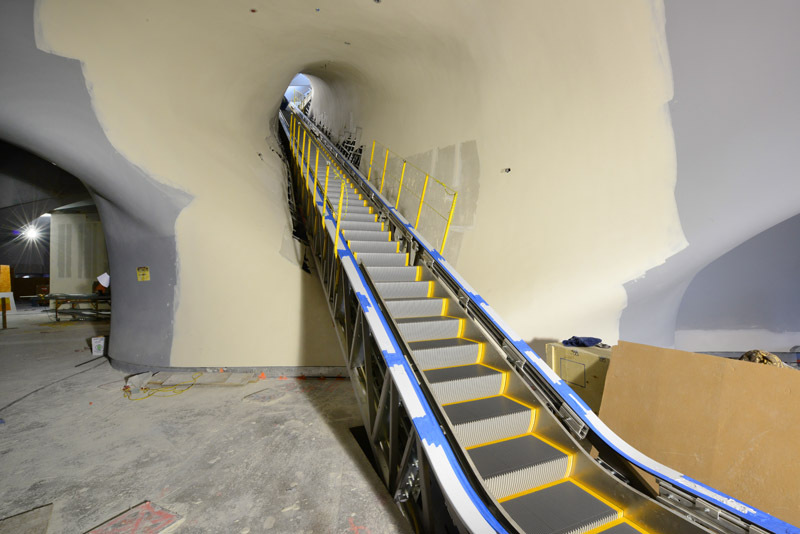 And to get you keyed up for the eventual opening, here are some of the latest construction images. It’s getting close! 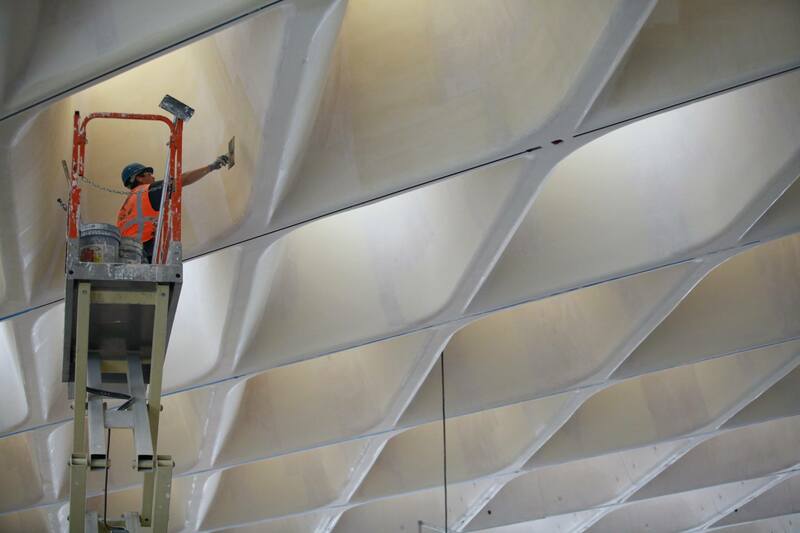 Sam Lubell: So what’s left to do at The Broad? Joanne Heyler: Everything that’s happening in the building is even better than I anticipated from the renderings and plans. The cylindrical glass elevator leading from the lobby to the third floor galleries is in and can operate, and its floor is lit up. To go from the first floor up to the top is really spine-tingling. The relief portions of the Veil (aka the lattice-like facade), wrapping around the Hope street side of the museum, are in and successful. The porous parts of the Veil, where scaffolding is still wrapped around, are going to become the image for the public. They’re still covered, but the scaffolding is coming down from the insides of the Veil. So on the third floor you can now stand in that expansive space and look towards Grand Avenue. Through the glass panels that are at the perimeter of that space you can see the inside surface of the veil exposed and that’s very exciting. 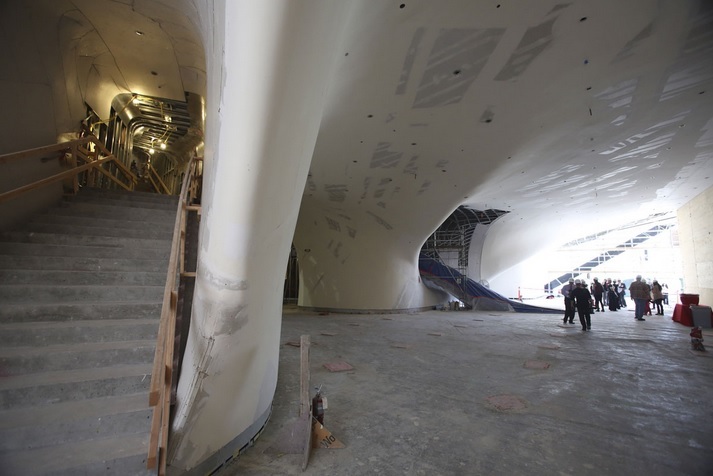 The building is very sculptural because of the Vault form (the Vault will contain the museum’s collection) creates the heart of the building, and that sculptural form is in place. Because of that it’s getting very close to complete and it’s very exciting. I’ve taken artists in the collection inside and gotten and incredibly enthusiastic response. The (24,000 square foot) plaza is very very close to being partially opened. It’s meant to open in November. 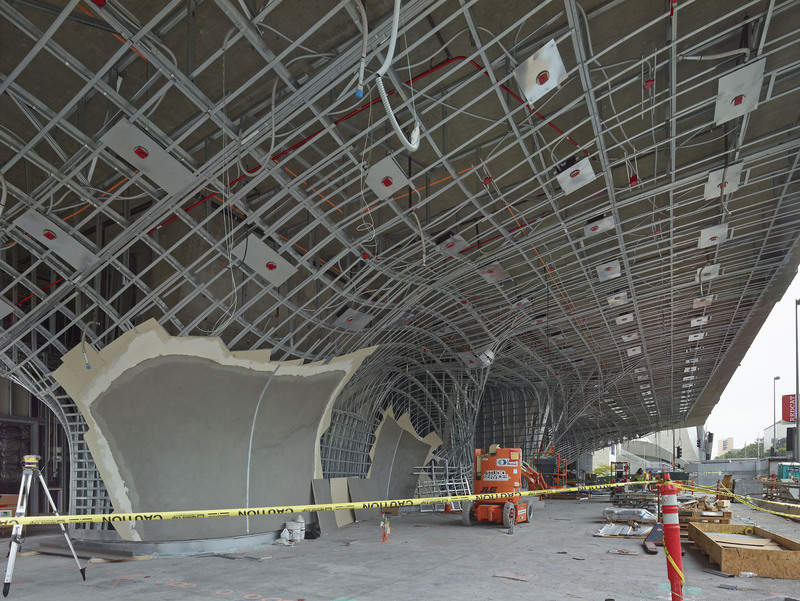 The oculus or dimple or fold that’s in the Grand Avenue portion of the Veil is coming together and there’s quite a view from inside. Really we’re making enormous strides. Because the building is so sculptural and dramatic it’s a more exciting hardhat tour than the usual. What were the project’s biggest holdups? The fabrication and installation of the Veil took far longer than was anticipated. However we’re at a stage now where we feel confident enough to at least name the season in which we’ll open, so we’re feeling pretty good about the progress that’s being made. We had a difficult time. But we’re on track now. Has the lawsuit with Seele (the facade engineer) been settled? It’s not settled, but I can’t comment on the lawsuit. Is there now a new engineer working on the Veil? No there’s no new engineer. Seele was taking care of that, and still is. Besides the Veil losing its structural capabilities, have there been any major changes since the project started? This building really has and is going to be completed very much the way that architects intended. I’ve seen other buildings go through many more twists and turns than this one has. Since the Veil issue there haven’t been any other major changes. Early on the elevator was added, but that was decided on a very long time ago. The other decision taken was to to expand the first floor public gallery space, but that decision was made early on as well. Do you believe the museum, and its plaza, will finally help enliven Grand Avenue? I think that it will. Our plaza offers a rare green space for the area. The olive trees that have gone in are 100-year-old trees curated one-by-one by the design team, and I am very proud of how atmospheric the plaza is as a result. It’s even better than I expected. I think it will be a very welcoming place for people. When the restaurant goes in there will be much more activity. I think we will play a big role in enlivening this stretch of Grand Avenue. It’s not yet full of day-to-day pedestrian activity, but I think those days are numbered. 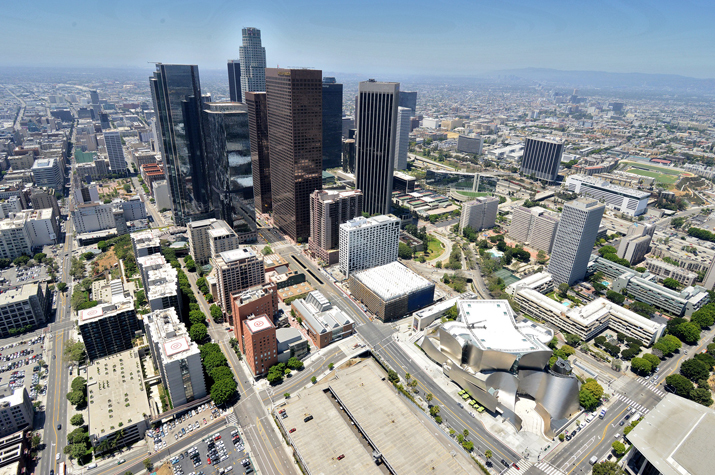 Given what’s happening at Grand Park (For instance Jay Z’s Made in America fest drew 35,000 people there) and as it becomes more residential that’s bound to become a factor in every part of downtown. We and the other institutions and Grand Park are increasing the number of reasons to come to Grand Avenue, not just for performances, but to linger and to get a meal. When the Grand Avenue Project moves ahead that will change it even more. The museum will be free of charge? The museum is fully funded by the Broad Foundation. Eli has always talked about having a populist approach to art museums and to making it possible for people to connect to contemporary art. When we looked at what made sense to us we felt free admission was the way to go so people could take in the collection in one visit or in several. To have that kind of relationship with the museum. That’s what we hope to foster. We’ll also have a robust scope of engagement programming such as artist talks and film screenings. We’ve already had audiences of up to 2,000 for those. That kind of response is very exciting and we hope a signal of things to come. What’s the biggest challenge moving ahead? I don’t really anticipate any more major architectural challenges. We’re too far down the road. Operationally we’re interested in putting together programming and visitor amentities that make as much use of digital technology as possible. We’re looking to see what form that will take in the museum. There will be more information. The emphasis will be on the building and on the exhibitions. How will you be programming the museum? The inaugural exhibition is very much in place. But the rest is very hard to pin down because we continue to add works week by week. 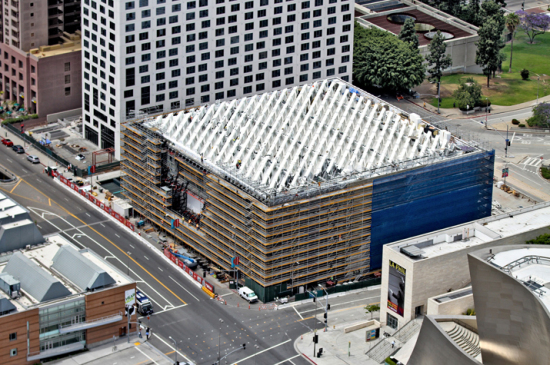 Will the Broad Foundation maintain a presence in Santa Monica, its current home? The building’s always been intended as the headquarters and home of the Broad Art foundation. That means we’ll be leaving Santa Monica. We’re all thrilled to be located downtown. When we launched this project downtown was buzzing, but it wasn’t what it is today. The whole array of residential units and restaurants and retail starting to percolate in interesting ways downtown—it’s just an incredibly dynamic time to be there. Does Eli have other architectural plans in the works? We’re pretty pre-occupied with this building. But you never know with Eli.